Accès skis aux pieds, maison de 3000 pieds carrés avec navette gratuite! * Seul le paiement initial est NON REMBOURSABLE. Voir Accord pour plus de détails. Caractéristiques: Quatre coins salon séparés, dont une salle de jeux avec table de billard, baby-foot et xBox. Wifi gratuit. Lits king dans quatre des cinq chambres, terrasse enveloppante avec bain à remous et barbecue, vues sur la montagne, arrêt de la navette gratuite dans le quartier à 1 minute à pied (en hiver uniquement). * S'il vous plaît noter que cette maison n'est pas les animaux de compagnie et fumer de tout type n'est pas autorisé. Les réservations de Noël ont un minimum de 7 nuits et doivent être vérifiées avant le 28 décembre. Réservations du Nouvel An ont un minimum de 7 nuits avec l'enregistrement au plus tôt le 28 décembre. Remises sur Breckenridge: nous travaillons en partenariat avec les entreprises locales de Breckenridge pour offrir à nos clients des remises sur la location de skis, de snowboard, de spectacles, de tubings, de navettes aéroport, de voitures, de soins de spa, de séances de photographie et bien plus encore. Notre personnel local de Book Breck est disponible tous les jours pour toutes sortes de questions et 24 heures sur 24 en cas d'urgence. Vues fabuleuses, mobilier magnifique. Léger et lumineux! Lumières du ciel, salle de jeux avec table de billard, ping-pong, baby-foot, télévision et chaîne stéréo. Super endroit pour sortir! Coin salon séparé au 3ème étage. 4 min en voiture de Main St! Arrêt de la navette vers le centre-ville de Breckenridge. Les gestionnaires habitent non loin de chez eux et peuvent également vous aider à trouver la maison / le condo de vos rêves dans les montagnes! This home was perfect for our group of 10 adults. We had plenty of space and beds. We have been doing mountain trips annually for almost a decade and this may have been the best property we've ever rented. The company was also great to work with and super helpful! Thank you for your review of Timber Hill Chalet. Glad to hear our staff was great to work with! Please come back soon. Very accommodating! They called several times making sure we where taken care of! Will stay again! Hi Shane.....Glad to hear you enjoyed Timber Hill Chalet. We find that calling our guests to check in with them is the best time for us to hear feedback to improve their experience and answer questions, not only about the home but the area in general. We like our guests to feel like they have a friend in town and we're glad you appreciated it. Please come back soon! We liked the 2 living areas downstairs except for the fact that they were smaller than expected. The dining area is way too tight - once someone sat down, you could not go around them - way too crowded there. Enjoyed the pool and foozeball area in the garage - the bad thing is that it can get very cold as they do not have the garage door sealed - air comes in as do the fumes from warming up the cars. There is a heater in there and we did use that and it helped. We had an issue with the master bath not holding water - maintenance was there the next afternoon to fix it. Thank you for that. The master bath has been recently updated. The rest of the house is nice, but not updated. hey were very timely on cleaning snow off the deck and in the parking area. Just hard to know when they will arrive as you cannot park on the street but you have to move your vehicles for them to get rid of the snow in driveway. Wish they could give you a time when they were coming. All in all, a good place. Hi Linda.....Thank you for your review of Timber Hill Chalet. We too wish our plowers could give us an exact time of arrival, but there are thousands of rental properties in town, all plowers have a long list of homes to plow and it's very hard for them to determine exactly what time they will be at each property due to weather conditions and what types of situations they find at each home (cars, amount of snow, etc) as well as how greatly travel time between each home can vary during bad weather. We're glad to hear you found the house well equipped. Our guests often tell us our homes are stocked better than any place they have ever stayed. We would have been happy to bring another space heater to the home if we had known the game room felt cold to you. We will suggest to the homeowners about looking at the seal and seeing if it needs improvement. We hope you enjoyed your time in Breckenridge and want to come back. Thank you for being a great guest. Good place to stay. A little stuffy as far as air circulation. I would have liked more views of the outdoors. Hi Susan...Thank you for your review of Timber Hill Chalet. Sorry to hear you found the home stuffy. We found all windows to be functioning properly upon inspection after your departure- perhaps whomever tried to open windows in your group was turning the cranks the wrong way? We have 46 photos of this home in the listing which accurately depict the views from this home. We're sorry you wished there had been more. We hope that you were happy with the customer service we provided and the things our staff did to accommodate your group's requests before and during the stay, however. Nice, with a few deficiencies. Only three of the four bedrooms were usable. Top floor was hot due to lack of ventilation. Lots of light bulbs out all over the house. Game room (poorly converted garage) was nice, but dark. Foosball table was unusable. Pluses were a nice living room and a seperate tv room with lots of seating. Quiet location close to hiking trails, and nice deck. Hi Gary.....Thank you for your review of Timber Hill Chalet. We are sorry to hear your stay was only 4 stars and not 5. We wish you had contacted us during your stay. The third floor of that home does tend to get stuffy on our warmest days and the home has a portable a/c unit in the master bedroom closet. We would have been happy to come over and set it up or bring more fans to the home. There are in fact 5 bedrooms at the house, not 4. Second, every single light in the home is checked to ensure all bulbs are working prior to guest arrival. We do not want our guests to deal with burned-out bulbs and we supply extra bulbs and batteries in all homes which are in the kitchen cabinet above the desk in that home (our guests tell us our homes are stocked better than any other place they have ever stayed). Again, we would have been happy to come over and change them ourselves had we known. We are glad you enjoyed the nearby trails, the deck, and the additional living areas. Your feedback on foosball table and need for additional lighting in the game room will be passed along to the homeowner. Please come back soon. This is not really ski in/ ski out. You can ski out, but you have to hike a half mile in. Be prepared to buy ice, as the machine does not work. Besides needing updates (bad), the house was very comfortable. Hi Ryan........Thank you for your feedback. 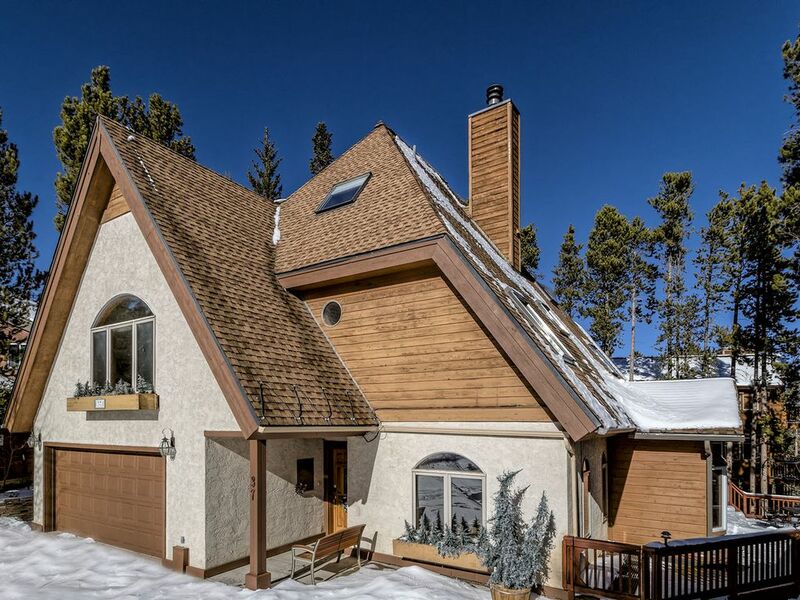 This home is advertised as being in a ski-in/ski-out neighborhood, not a ski-in/ski-out home. We agree that the back-in section is uphill and this is why we have videos for our guests to see first hand what it looks like. Although we are not able to share these links on our VRBO listing, we can provide them after a guest has booked. The master bathroom is receiving a full remodel in May/June and will be ready for our summer bookings. We're sorry about the ice maker not working and glad that you have let us know so that we can have it repaired. We're glad to hear that you were comfortable otherwise and hopefully you enjoyed the sparkling clean hot tub and other amenities the home offers. Rates & minimum night requirements vary depending on group size & week!